What Vegetables are the best and easiest to grow? 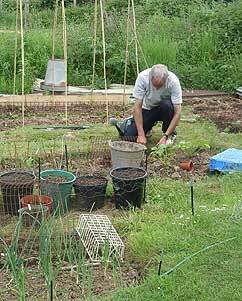 What vegetables you decide to grow in your new Veggie Patch depends mainly on the space you have, but in your first year it is probably wise to select Vegetables which are a). known to be reasonably easy to grow and b).those you enjoy eating (obviously!). What I would say is that every Vegetable has quite a few varieties, so after you've selected what you're going to grow, pop down to your local Garden Centre and look on the back of the packets. For example, not every Lettuce has the same sowing date, so finding this information out will assist you in final planning. You can either build 'the tent' like system of poles or try the Pyramid type. 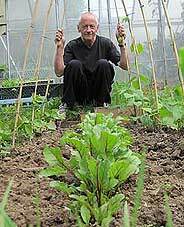 Whichever you choose, Runner Beans are relatively simple to grow and don't need too much attention. When planting out into the soil, bury some newspaper a few inches down. When it rains, this will soak it up and retain the moisture for longer. Personally, I've had better results growing mine in Pots, but if this isn't possible, just make sure the soil is absolutely stone free. If it isn't you'll get one not far off the one on the right!! When growth is under way, protect them from Carrot Fly by shielding them in all directions with some netting. These bugs fly horizontally, so you only need shield the sides. You can either start these from seed and plant out, or take the easier route on your first year of buying Onion Sets, or at least have Sets in mind should the seeds not do well. I've brought two bags of Onion Sets and this amounted to 180 Onions! It's a good idea to plant them out making a little island shaped mound to allow rain to go away from the main plant and soak down to the roots. These are again, easy Vegetables to grow, the only thing is they need space, you're thinking in correct terms of planting them three feet apart. The yield when it comes is fast and furious, you'll be having Courgette's with everything and trust me, you always find a huge one you've missed when harvesting some and wonder how you did! Very similar to Courgette's. I found my best year was when I planted mine out on an old bonfire. It was stony and I worried it wouldn't work, but they proved me wrong and Squash Soup on a cold late October or December day is something else! If you want lots of Spinach, get 'Perpetual', it grows like a weed and the more you cut, the more it will grow. You'll be surprised at how many leaves you need for a meal though, so don't worry too much if it appears you're overgrown with them. There are so many varieties of Lettuce nowaday, so choosing which one is personal taste. You can go for the Lettuce plants such as Cos etc. where you basically eat the Plant and that's the end of it or go for 'Pick as you Go' which is similar to the Spinach where it simply makes up for itself as you eat it. Then there's the Ornamental varieties which whilst they're growing will give you Garden a bit of colour, even along your Flower Borders. This is a 50/50 depending upon space. If you go for outdoors in the soil, they're going to need a lot of room (and a lot of digging!. For this reason, why not try growing them in Containers, Pots or special growing bags. You simply put the seed potato at the bottom and whenever you see leaves appear, cover up. Keep on doing that for as long as it takes, usually around 12 weeks, and you'll have a good crop. Potatoes are subject to a lot of diseases, so Container may be the way to go. The Greenhouse if you have one is the ideal environment for many Vegetables, especially Tomatoes. If you have space, go for two or three varieties and get the choice. Read the instructions carefully on the back of the packets and all will be well. 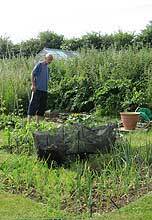 In my 8 x 6 and 12 x 8 Greenhouses, I have had 30 Plants growing - With the Onions and other, loads of Chutney, Relishes and Sauces! Tomatoes of course, can also be grown well in Grow bags or Pots. Cucumbers, Chilli's and Peppers are also quite easy to grow in a Greenhouse. So all in all, even if you do just go for the above, you could be eating well in Summer, Autumn and with a Freezer or alternative storage, well into Winter as well! 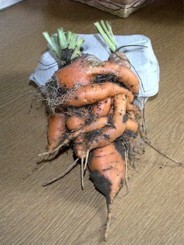 The result of sowing Carrots in stony ground ! !